This edition of the program is devoted to an extraordinary woman – Maria Bochkareva — better known in the West as the Russian Jeanne D’Arc. During World War I she signed up as a volunteer for the Russian army. Maria’s courage and bravery won her four Crosses of Saint George, one of the most prestigious Russian military awards. Maria was born in 1889 in a village nor far from the city of Novgorod in north-western Russia. Later the family moved to Siberia in search for a better life. Maria got married at the age of 16 but was unhappy with her husband – a drunkard and a brute. Strong-willed, with a bent for self-sacrifice, Maria tolerated his harsh treatment, hoping that he would sober down, but unable to bear it any more, she finally left him. In vain she sought happiness in love: the men she loved only made her suffer. So she started thinking if there was some other field into which she could throw all her energy. In 1914 Russia entered World War One. The situation on the Russian-German front was getting hard for the Russians. Reports about heavy casualties among Russian soldiers prompted Maria to join the army. As it turned our later, that was just what she had been looking for. When, in November 1915, she appeared before commander of a regiment stationed in the Siberian city of Tomsk and told him she wanted to go to the front, he wouldn’t even listen to her, but simply ordered her out. Unwilling to give up, Maria sent a telegram to Emperor Nicholas II in St.Petersburg. The Emperor cabled back, granting his royal permission to admit Maria as a volunteer into the Tomsk regiment that soon left for the front. A fearless soldier as she proved to be, Maria, hardly over 25, took part in bayonet attacks and reconnaissance squads, carried out the wounded under heavy enemy fire. She was wounded four times, two of them seriously. But some inner vitality put her back on her feet and she returned to the regiment to the rousing cheers of her comrades in arms. For her prowess and dauntless courage she got four Crosses of Saint George and was promoted from private to junior officer. Maria became a legend in her lifetime. Reporters begged her for an interview. Her laconic, witty and image-bearing answers revealed an extraordinary personality looming though the shell of a free-and-easy fighter-girl. There came the year 1917 and the news of the February revolution. The Czar abdicated and there was formed the Interim Government. All this caused unrest among the troops. Military failures and calls by Bolsheviks to lay down arms resulted in mass desertions. The new government invited Maria Bochkareva to St.Petersburg to report the situation on the front. She arrived at the General Staff. Wearing soldier’s boots and a uniform with the shoulder-straps of a non-commissioned officer, all four Crosses of Saint George shining on her bosom, with her service cap on, her face rough and weather-beaten, she had a strikingly masculine appearance. She announced her name in a coarse, mannish voice and only her eyes, gray and sad, betrayed her feminine origin. Unembarrassed by the glamour and opulence of the Tavrichesky Palace and curious looks men in tail-coats darted at her, she declared that the troops were demoralized and suggested setting up women’s formations that would boost the troops’ morale. Her speech was so convincing that after a slight hesitation the government gave her the go-ahead to form a women’s battalion known as the Bochkareva death battalion. There was, indeed, something sinister in its name and in black shoulder-straps with an emblem showing a scull and two crossed bones, which symbolized the women’s readiness to sacrifice their lives for their homeland. Maria issued an address to the women of St.Petersburg: “Citizens to whom the liberty and happiness of Russia are dear, hurry up to join our ranks before it’s too late. Don’t spare your lives…” Thousands of them — housewives, lyceum students, young ladies from noble families, workers and peasants – signed up for volunteer women’s formations. One must give credit to the Bochkareva death battalion, it fought heroically and endured all hardships of warfare. They were in the trenches when news arrived about the Bolshevik coup in St.Petersburg. 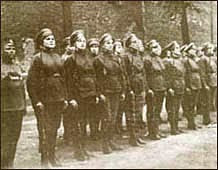 Bochkareva was arrested and her battalion was disbanded. When offered to take the Bolshevik side, she refused, saying that she was too tired of war. Not grounded in politics, though, she realized at the moment that while yesterday Russia had been fighting the enemy, now it was moving towards self-destruction. Unlike most men, she didn’t want to meddle in a fratricidal war. After she was released, Bochkareva decided to go to her village. It was a terrible journey. She nearly died when Bolsheviks threw her out of a railway carriage. Crippled and penniless, she eventually came home. In 1918 Maria traveled to the United States at the request of the anti-Bolshevik White Army command to obtain financial and military aid. On July 10th she was received by the then US President Woodrow Wilson. He said it was a great honor to him to meet the lady officer who had covered herself with glory and that in America they called her the Russian Jeanne D’Arc. To his question “who is right and who is to blame in Russia?” Maria answered evasively that she knew little about the matter and wouldn’t like to get into an awkward situation. At the same time she asked for guns, tanks, food supplies and troops, which left no doubt about her political sympathies. Maria’s eloquent description of war-ravaged Russia produced a deep impression on the Americans. President Wilson pledged support. From America Bochkareva went to Britain on a similar mission. After a brief audience with King George V, she returned to Russia. Even though her sympathies lay with the “white”, Maria stubbornly refused to take part in the war against the Bolsheviks. Her stand irritated the “white” command, and, finally, they decided to get rid of her. Maria went back to Tomsk where she changed military uniform for civilian clothes, got herself a bright kerchief and began attending church. The church atmosphere, the quiet signing of the chorus, the flicker of candle lights, gave her comfort and relief and gradually the heavy burden of the past relaxed its grip on her heart. Once a boy in the street asked her: “Granny, give me a penny for a honey-cake”. Maria slipped coins into this hand, and, back home, glanced at herself in the mirror. She didn’t like what she saw. Untidy hair with streaks of gray made her look well over 50. Did you think about choosing the most recommended Bitcoin exchange service - YoBit. If you're trying to buy bitcoins online, Paxful is the ultimate source for bitcoins as it allows buying bitcoins by 100's of different payment methods, such as MoneyGram, Western Union, PayPal, Visa, MasterCard, American Express and they even allow exchanging your gift cards for bitcoins. Did you ever try to automate your free bitcoin claims by utilizing a BTC FAUCET ROTATOR? Join millions who have already discovered better strategies for investing in Ripple. Learn from established eToro traders or copy their positions automatically.